Each year our students achieve outstanding success in VCE and NAPLAN. Whether they attain a high ATAR, their personal best in one or more subjects, or gain entry into their course or pathway of choice, we are proud to be part of their journey and celebrate their achievements. 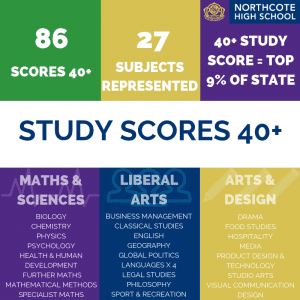 Northcote High School has a reputation as a leading provider of rigorous academic education. Most significantly, our school has maintained and sustained its absolute commitment to providing an exemplary education to the young people of Northcote and surrounding areas. We are very proud of our class of 2018. This was a cohort that demonstrated determination, a commitment to hard work, creativity and a strong community spirit. Their results in the VCE, as well as their achievements in the VCAL and VET programs, have given them an excellent path to future learning and exciting opportunities ahead. NAPLAN (National Assessment Program – Literacy and Numeracy) is an annual assessment for all students in Years 3, 5, 7 and 9 in Australia. The tests cover skills in reading, writing, spelling, grammar and punctuation, and numeracy. The assessments are done every year in May. As with VCE results, NAPLAN results provide the school with an annual snapshot of cohort achievement, trend data and of the learning progress of individuals. We use this data to inform curriculum planning and target instruction. 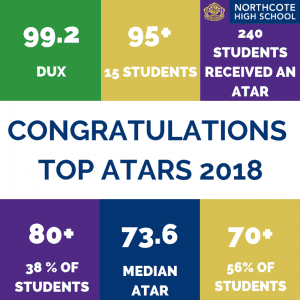 Over the last five years, our Year 7 and Year 9 groups have achieved results above the state and national averages in all NAPLAN test areas (Numeracy, Reading, Writing, Spelling, Grammar and Punctuation). At consistently the same level for demographically similar schools. Consistent high level of relative growth for our Year 7 students from Year 5 across all test areas. High level of relative growth for our Year 9 students from Year 7 across the test areas of Reading, Writing and Spelling. These results show progression well above national averages and comparable to, or better than, similar schools. The results are a significant endorsement of the excellent performance of our students and their teachers. To see our NAPLAN results, visit My School website. How we assess, report and provide feedback.